It’s Suuunday again and so it’s time to smart saver. You just want to get a snack and a coffee but don’t want to spend so much money? You don’t have to, if you will join Tim Hortons for a coffee and a snack. For a muffin and a pretzel Bagel ( yeees, right! They offers pretzel Bagel) you have to spend only $3. The coffee is much cheaper than at Starbucks and even better. You can get there all snack you can imagine. From bagels in different versions, sandwiches and wraps to cookies, muffins and a great variety of delicious donuts. 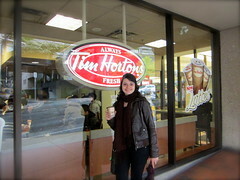 Go, have a yummi break at Tim Hortons and safe some money. Since the rain starts its the best way to got to the cinema. Unfortunately it’s a little bit expensive, as you pay $11-13 for one movie in Vancouver. Buuut not on Tuesday. Tuesday is movie day in Vancouver, so you’re able to see one movie for only $7,20. I really recommend the Scotiabank Theatre Vancouver, because there you have the opportunity to get popcorn with different flavors, such as chocolate caramel, cheese, marshmallow and much more. The cinema is the best way to make these rainy days more interesting and for those, who aren’t English native speaker, it’s a easy way to improve your English skills by watching movies in English. Get out and enjoy your stay even though it’s raining. We wish you a great start in the next week. Do you feel like you need new experiences? or that you’ve missed something but you don’t know what it is?Or do you just simply love animals and have a passion for helping those that are orphaned or injured? Don’t look further, because a Volunteer program could be the answer for you. INTERNeX offers a volunteer program as one of our many options for working abroad, where you will be able to feed the passion for animals while doing good in a community. 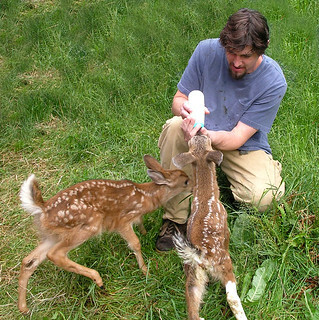 The volunteering program is the perfect opportunity to make a difference in local communities and wildlife; you can help to rescue and rehabilitate injured animals as well as orphaned animals in Canada or Guyana! But this is not only an opportunity to help animals, but it is also an opportunity to improve your English, experience different cultures, and travel to a different country! There are a few requirements that you have to meet to begin your volunteer adventure. First of all, you should definitely have a passion for volunteer work and a love a lot animals. You should also be physically fit and willing to work with animals! It is definitely a great opportunity if this area interests you! A volunteer can quite exhausting at times but will definitely be very rewarding. My Name is Tobias Rechtenbacher, but you can call me Toby! For the upcoming seven weeks I will support the PR team at INTERNeX. I know it’s not for long, but I definitely think it will be a great time and an amazing experience! I’m a 21-year-old student from the South of Germany doing a dual education course, i.e. I spend the same amount of time in both practical training and theory (3 months in a company, 3 months at university). What am I here for? Vancouver obviously is one of the most beautiful cities in North America. Combined with my position at INTERNeX and the chance to improve my fluency in English, Vancouver is the best place to be. My hobbies are sports in general, in particular soccer and tennis. But I love hanging out with my friends as well! If you have any further questions about me at all, please feel free to ask me! I definitely hope that I will meet many of you, and maybe there is enough time to make a picture together. 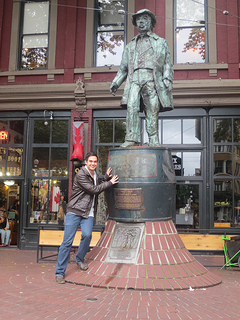 That way, I can remember all the amazing moments here in Vancouver! I’m Mercedes and I’m the new PR intern. I was born in a Spanish city called Vigo, right in the Atlantic Coast, and that’s probably the reason why I love the sea and the beach so much. I was really shocked when I firstly arrived to Vancouver due to the weather: foggy and rainy. I left the sunny and warm Spain, but I’ll do my best to get along with this weather. I’m sure this wonderful city has a lot to offer to everyone. I’m studying Advertising and Public Relations at the University of Vigo and I want to achieve a career in International Relations and Marketing. By the way, last year I studied in Austria. So yes, I speak German, but I’m not as pretty good as I’m with English. At the moment I’m here for taking some work experience and for having a university break. Talking a little bit about my personal hobbies, my passion is traveling and meeting new people. I really believe that traveling makes you always seeing life in a new perspective and makes you think who and where you want to be in life. 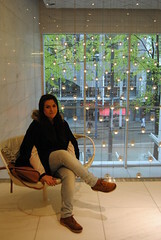 During my free time I go shopping (as you can see in the picture taken in the Pacific Centre), I hang out with friends or I just stay at home watching a movie. 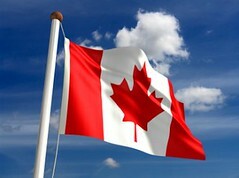 I hope this experience in Canada will fill my life with wonderful memories, a lot of good times and amazing people. I’m really looking forward to getting to know all of you really soon and please, feel free to chat with me anytime or leave a comment! You went to language school, you lived in Canada for a while, you tried to speak English only, and you are still not quite content with your English? Please read in this Culture Shock post how to sound like a real Canadian. There is no problem without a solution, eh? Eh? = sorry, what did you say? Try it out and let us know how it works, eh!